A little over a year ago, it seemed a piece of motoring history might be biting the dust when Swedish car maker SAAB, who were then owned by US giant General Motors, filed for ‘reorganisation’ which is effectively the same as Chapter 11 Bankruptcy protection. In mid 2009, it appeared Saab would be saved by a deal involving Swedish sports car maker Koenigsegg and indeed some agreements were signed, but that deal fell apart leaving Saab again teetering on the edge of oblivion. So in some ways, its amazing that the car we are testing today is here at all, because it so nearly wasn’t, OK it had a head start as it was already planned to go into production before Saab’s problems, but it wouldn’t of happened without a saviour. Salvation however came from the most unusual source, yet another luxury sports car maker, but this time is was the Dutch company Spyker who’s chairman Victor Muller’ agreed to pay General Motors $74 million dollars to take over the ailing Swedish car maker in February 2010, and in doing, secured the future of the brand and the jobs of around 5,400 workers at Saab’s Trollhätten factory in Sweden and the employees of Saab Great Britain. Saab’s have been around since 1947 and have always been kind of quirky, particularly in there early days (although they would say they were simply challenging convention), but GM’s influence has dulled that down a lot and whilst still allowing Saab to have its own unique identity, G.M. brought the product into the main stream and made it a real alternative to everything else that’s out there and as such, potentially a serious player in today’s market. The Saab brand certainly has an element of prestige about it, however, but in terms of customer perception; it’s not up there with Mercedes, BMW and Audi. That said, Saab also wouldn’t see itself sitting alongside cars like Peugeot, Citroen, Ford or indeed its parent Vauxhall and that leaves it in a kind of mid ground which is occupied by brands such as Alfa Romeo, Lexus, Honda and its Swedish rival Volvo, all of which have a certain cache about them, but have never achieved the prestige, recognition or desirability of the 3 big Germans. The new Saab 9-5 was styled at the General Motors studio in Russelheim in Germany, and indeed, is indeed a handsome thing and looks even better the longer you live with it and begin to appreciate its pretty bodywork, and undoubtedly, the 9-5 provides us with a first look at what the face of Saab, is likely to be on the models yet to come, such as the next generation 9-3 and the much talked about smaller 9-2 model. OK, I am prepared to admit the new 9-5 is a little chunky and perhaps the rear end is slightly ungainly and ok, perhaps it has a touch of an American look about it, but its going to stand out compared to the cars from the German makers because of this. Sitting on a stretched version of the Vauxhall Insignia chassis and with MacPherson strut front suspension and multi-link independent rear, the new 9-5 offers a comfortable yet responsive ride, although, weighing in at 1.7 tons it is a big heavy car and if you push it, its not going to handle as well as some of its illustrious competition such as the 5 series BMW or Audi’s big A6. That said, is this really the kind of car you push? I think probably not, but if you’ve got a long journey to do, the new 9-5 is going to tick all of your boxes, delivering a quiet, comfortable, relaxing and enjoyable experience. Inside the new 9-5 it’s an odd mix of Saab and Vauxhall, but it seems to work, in fact I would say it really works. Despite some reviewers saying the cars interior was gloomy, we didn’t think it was, we thought it was some of the classiest use of plastic we’ve seen for some time (and I am not being rude by saying that). The traditional Saab wrap around dash is still there, but its brought bang up to date and its so unfussy and whilst that does mean big areas of unoccupied plastic, we liked the clean sanitary business like look and the fact that Saab hasn’t tried to pack every inch with buttons. We do however to a lesser extent, have the same criticism of the dash that we had with Insignia and that’s that its switchgear is overly complicated and that there seems no logic to the way its all been laid out, but unlike Insignia, the Saab is something you can come to grips with quite quickly. The new Saab 9-5 is a big car with a big interior and the seats on our car were leather, good looking, comfortable and electrically adjusted and all in all we thought the cars interior was a quiet and refined place to be, but the most obvious thing about the interior is the amount of space, it’s simply huge and far bigger than any of its competitors such as 5 Series and A6 and that adds to the perception that it’s a luxury vehicle. The cars instrumentation was concise and clear and of course it’s a Saab so it was fitted with “night light” control, which means that with a touch of a button, you can turn of all of the instrument lights to make things less stressful on your eyes whilst driving at night and it’s only the cars speedometer that remains visible. On the subject of speedometer, we loved the cars additional digital “rolling drum” speedo which lives in the display between the dials and looks just like the altimeter or level flight display in an aircraft, nice that. Our car was the “Vector SE” spec and fitted with a 158bhp turbo-diesel, mated to a six speed automatic box with paddle shifts on the steering wheel. Gear changes were smooth and effortless and whilst I share a hatred of the paddle shifts on anything other than super-cars, the Saab responded reasonably quickly, although I can’t really see why you would ever need to use them and so for me, they are like a broken pencil “pointless”. The new Saab isn’t just a pretty face either as its loaded with safety features and as a result, has just been awarded the maximum 5 stars by Euro N-Cap following crash testing and the cars standard equipment includes:- Driver and passenger dual stage front impact airbags; side impact thorax airbag; head protecting side airbag curtain; front seatbelt double pre-tensioners and load-limiters; sensor for deployment of side airbag curtain and belt pre-tensioners in rollover; ISOFIX and top-tether child seat anchorages in rear seats; front and rear seatbelt reminder system; anti-whiplash head restraints; electronic stability control; brake assist; electronic brake force distribution; forward collision alert; lane departure warning; head up display; traffic sign memory; adaptive forward lighting. The 9-5 is available in two trim levels, the Vector SE and Aero, with a choice of 3 petrol engines, a 1.6T producing 180ps, a 2.0T producing 220ps and a range topping 2.8T which ups the power to 300ps. The Diesel options are a 2.0TiD that produces 160ps and the 2.0 TtiD that ups that to 190ps and all of the engines are of course Euro 5 compliant. There are a couple of models that are available with 4wd, which Saab calls ‘XWD’ and a 6 speed automatic transmission is available across the range, with the exception of the 1.6T, 2.0TtiD and 2.0 TtiD XWD. On the road prices start at £26,495 for the 160ps 2.0TiD Vector SE, raising through the range to £37,995 for the 2.8T XWD 300ps Auto. All in all, this new Saab could be a serious player, as it does everything pretty well, it’s massive inside, and it’s got a large boot and lots of bits to play with. The new 9-5 is a good looking thing and it will have a certain cache due to its scarcity value as there are never going to be as many around as there are Audi’s or BMW’s. As a result, we think if you pick the right model, it represents what a supermarket might refer to as “big box value”. In other words, it’s “a lot-a motor for your money” OK it might not have a trendy German badge, but maybe that’s good because it tells everyone you’ve bought the car simply because you like it and being honest, what’s wrong with that. In conclusion, the Saab badge will play a big part in deciding to have this car or not, as will the price and whilst you could argue that the close association with GM through Vauxhall has to be good, and indeed that there immense resources have clearly have given the new Saab a good start in life, I wonder how long it might be before you start to feel that all you’ve bought is an expensively priced Vauxhall, albeit, a very good one. 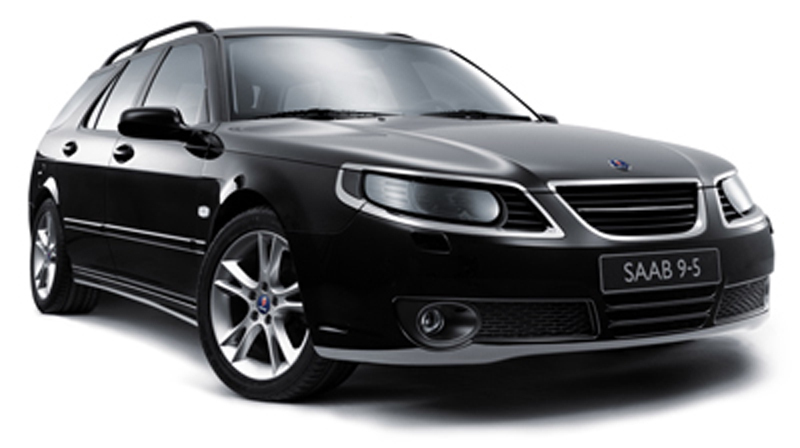 For a quotation on the New Saab 9-5 or on any other SAAB, please contact us.